India adores it's scientists, and not to be left behind, politicians like to bask in the achievements of our boffins. The people of this nation erupt with joy in unison whenever technologists make giant strides in space. Yet, at the same time, national developments in atomic energy, genetic modification, clinical trials, solutions to air pollution and industrial research among others are being hobbled since controversy dogs these areas. Why are scientists not standing up to be counted? In fact, communication between the public and the scientific community is increasingly getting broken. How do we fix this ailing situation where scientists are steadily losing the plot? What needs to be done to rectify the situation and to win back the trust? Pallava Bagla (55) is a charismatic science communicator respected for his deep understanding of Indian S&T system. He has won many national and international awards for his work. Explaining complexities of science in a simple language is his forte. He has extensive experience in reporting about the Indian atomic energy program and was a frequent visitor to the Indo-Russian reactor site in southern India at Kudankulam where two 1000 MW reactors are operational. He has visited nuclear facilities in Vienna, Finland, Russia, USA and France. His pioneering work show casing India’s maiden mission to Mars and Moon has been applauded this aired in English and Hindi for New Delhi Television. 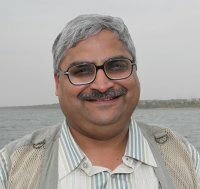 In his two decades of writing for the prestigious American weekly Science, his stories have highlighted India to the world. He was won three national awards for his science writing and he runs a daily photo blog on Twitter titled `Enjoy Nature’ and has authored several books. He has won three national awards for excellence in journalism the last at the hands of Prime Minister Narendra Modi. In 2010, he was awarded the `David Perlman Award for Excellence in Science Journalism’ given by the American Geophysical Union, Washington DC, considered the `Oscar for Science journalism’ for his landmark writings which exposed the Himalayan glacier blunder by the UN’s Intergovernmental Panel on Climate Change (IPCC).